From webcomics to print comics and everything in between, there’s a lot to learn about the world of comic art. And in this guide I’d like to share the absolute best books covering everything from art direction to storytelling and sequential art structure. This post is truly the ultimate guide to learning art for comics no matter what type of comics you want to make. Just be sure that you also spend some time practicing the fundamentals before diving into these books. It’s good to have at least some experience drawing from imagination before you start trying to draw your own comics. This unique comic-oriented guide offers a deeper look into the world of comics. 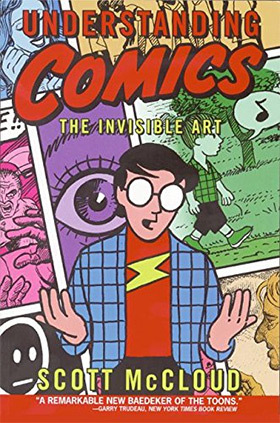 Understanding Comics: The Invisible Art uses traditional paneled storytelling to explain the history of comics, how they work, and how panel-based storytelling has grown into a cultural phenomenon. Author Scott McCloud is also an accomplished artist who has created his own comics for years. He doesn’t share any specific advice about making comics, but he does reveal some of the “secret sauce” used in the making of great comics. You’ll learn how sequential art is created, how it functions, and how readers typically consume this content. Artistic comics have been around for ages and while the content has changed a lot, the formulas are still very much the same. I recommend this book for comic aficionados who want to peek behind the curtain of how comics really work. It’s also a great resource for inspiration to re-read when you’re short on ideas. 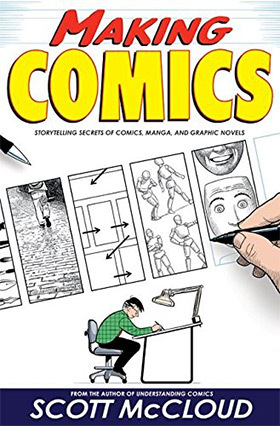 Here’s another book by Scott McCloud that takes a look into the mechanics of comic creation. Making Comics covers 260 pages of tips, techniques, advice, and visual explanations on making comics for the web or print. This book follows the same format as Scott’s others using comic panels to explain the narrative. 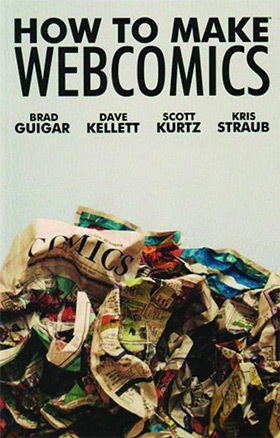 However much of the early chapters focus on the psychology and consumption of comics, some of which is covered in his other title Understanding Comics. But all the other chapters delve into details about construction and artistic techniques for composition, posing, and facial expressions. Scott McCloud is a trusted source in the world of comics and I simply adore his books. I would absolutely recommend both titles but if you had to get just one then Making Comics is the way to go. Graphic novels and superhero-type comic books follow a different structure than the humorous comic panels you find in a newspaper. And that’s where the book Foundations in Comic Book Art comes into play. 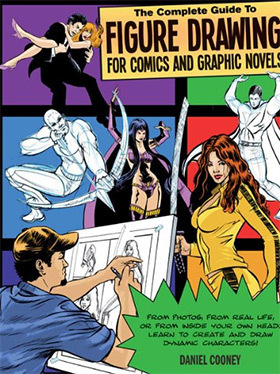 This book targets artists who want to create their own graphic novels from scratch. The author John Paul Lowe is an art instructor at SCAD with over two decades of art experience. 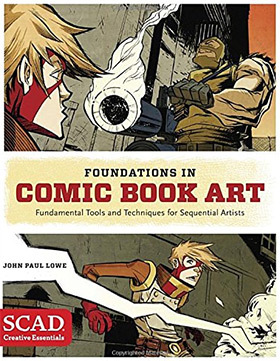 In this book you’ll learn all the basic fundamentals of comic art and why they matter. John places a heavy focus on composition, perspective, and photo reference as applied to graphic novels. Your composition needs to be on point to tell a great story. But you can get by using a few shortcuts shared in this book. Also this book is full of examples of comics made by SCAD students and professional artists alike. It’s an excellent introduction to the world of comics for aspiring graphic novelists. 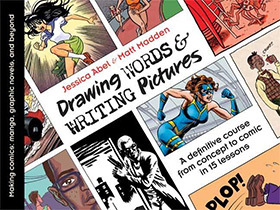 In the cleverly titled Drawing Words and Writing Pictures you’ll find a wealth of information about making your own comics and improving as a comic artist. Over 300 pages you’ll learn how to create comics that work, how to gauge their quality, and how to plan your ideas visually moving from concept to completion. This guide is like a full course made for self-studying artists who want to improve their comic-making abilities. Early chapters cover the fundamentals that make up a great comic. As you move through the book you’ll learn about lettering, story structure, and panel design to organize a sequential story. Each chapter comes with a variety of exercises to complete. This work will help you master the art of comics and you’ll find plenty of inspirational work from other talented artists. 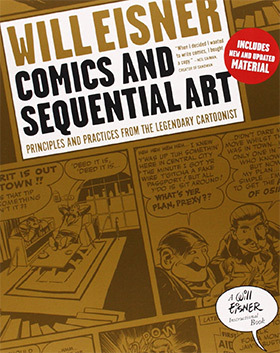 I cannot recommend this book enough because it really is the best practical guide to learn comics from scratch. It’s now easier than ever to self-publish your own webcomic online. But there’s still a technical process involved with creating and publishing a webcomic from scratch. How to Make Webcomics distills the publishing process into smaller chunks to help aspiring artists pick up the pieces and move forward with their ideas. This is not a catch-all book and you will need to put in some research on your own. But this book does work like a self-planner to help you think of ideas, characters, compositions, and a writing style to match. Later chapters cover the process of branding your comic with a great name and building an audience. What I like most about this book is the practicality. As you read through this book you’ll be inclined to take action and start planning your webcomic right away. Note this book does not teach you how to draw or how to improve as an artist. For that you should pick up a beginner’s drawing book to practice on the side while outlining your webcomic. There is a real art to making comics and it’s tough to teach. But Alex Simmons’ Art of Making Comics does a pretty good job at it. This is a short book and it’s one of the more recent publications in this list. Over 80 pages Alex covers the basics of art for comic creation including ideas, writing, sketching, and coloring. He also shares tips for getting published with companies or newspapers, or even self-publishing if you go that route. Either way this book is a treasure trove of information packed into a small 80-page guide on artwork. Alex has years of experience working in comics and his advice is well worth skimming. Note that you should already have artistic experience for this book so you won’t get much hand-holding along the way. Most artists choose to self-publish because it’s easier and offers more control over the end product. 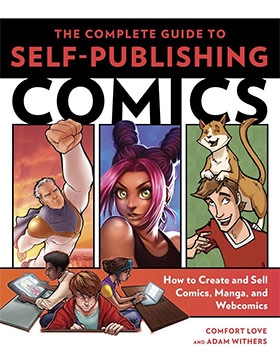 The Complete Guide to Self-Publishing Comics truly stands by its title with 240 pages of tips and guides to help any artist publish their own work. You’ll learn about the entire comic creation process including writing, drawing, lettering, and finally publishing/distributing your comic to the world. The book features actionable tips along with short snippets from other professional artists in the field. You’ll learn about plot, story, character, and creation along with publishing and marketing your ideas. Most of these tips come from professionally published comic artists and this advice is great for newbies just getting into the field. This is a must-have book for anyone getting into comics whether you wanna write funny comics, graphic novels, mangas or something else. Published comic books often go through a much more detailed writing process. This can be intimidating for artists who don’t spend much time writing. But The Art of Comic Book Writing covers this subject in great detail. You’ll learn how to visualize ideas, outline and write a script, then sketch compositions for each frame. This is the definitive guide to comic writing from the standpoint of an artist. Not all comics require as much detail in the writing process. But many of them do, and if you want to break into comics then you’ll benefit from building up your writing skills. This book also has tons of real-world examples and guides from professionals who have experience working in the comic business. The Webcomics Handbook is purely a look into the business, marketing, and scalability of webcomics. This is actually the sequel to the book I mentioned earlier How to Make Webcomics. Both of these titles work well together because they cover different aspects of the industry. 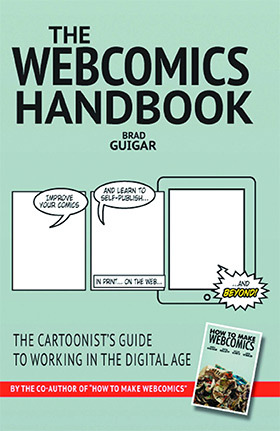 In The Webcomics Handbook you’ll follow a step-by-step process teaching everything like branding, advertising, promotion, marketing, and publishing on the web. Designing a comic from scratch is never that hard. But actually making a good comic and getting people to check it out can be much harder. If you seriously want to make a webcomic then there’s no question about it: you need this book. It’ll change the way you view the artistic process and will help you avoid common pitfalls made by beginners. Whether you’re a pro artist or just getting started you should already know that perspective is huge. It’s a crucial part of any composition and the process of mastering perspective can be grueling. But Perspective! 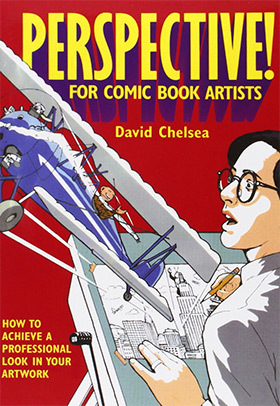 for Comic Book Artists teaches perspective from a unique vantage point. It looks at individual comic panels and teaches you to find the perspective using shortcuts and quick tips. Your perspective may never be perfect. And with comics it doesn’t always have to be(aside from graphic novels). In this case the book takes beginner perspective topics and pushes them even further. You should already have some basic knowledge of drawing before you pick up this book. It won’t be easy to work through but you will learn a lot from these exercises. Another crucial skill necessary for all artists is figure drawing. This involves studying the anatomy while also analyzing how certain figure poses distribute weight. The Complete Guide to Figure Drawing for Comics and Graphic Novels is a real guide on figure drawing. It’s almost 200 pages long and packed with advice for aspiring comic artists. However this is not purely an anatomical figure drawing book. Instead the author uses tips and shortcuts to illustrate how you can sketch poses quickly from your imagination. This is a crucial skillset that all comic artists need to develop. But make sure that you balance imaginative drawing with life drawing to hone your artistic ability. And if you want to truly master the figure then pick up an anatomy book to study the figure as it pertains to artists. Will Eisner is a talented artist with lots to share for the next generation of artists. In his book Comics and Sequential Art Will shares tips and theories behind great graphic storytelling. Sequential art can break down into anything. It could be a graphic novel, a manga, a storyboard, or a silly comic strip. But they all share the same storytelling medium and Will addresses this in his book. You’ll learn about creating realistic dialogue, building characters, framing each shot, and lettering in a legible style. This book was recently updated with a new section on technology for digital drawing tablets and digital publishing. There’s so much to be said about sequential art that’s perfectly summarized in this book. This is an amazing read for any artist no matter what type of comics you want to make. 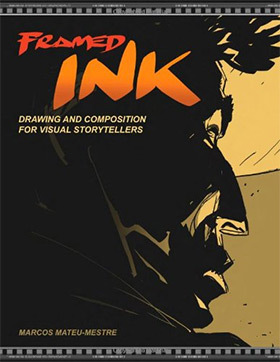 Framed Ink is a book made for aspiring comic artists and written by a professional comic artist. Author Marcos Mateu-Mestre has years of experience drawing, inking, and writing stories for comic books. In this guide you’ll learn all his suggestions and secrets for upcoming artists. He covers tips for outlining a great story and creating characters that are believable. He also writes about creating scenes that make readers feel emotions whether they’re angry, sad, curious, or left in suspense. Framed Ink looks at visual storytelling from the perspective of a story teller. You want to grab people’s attention not just with art, but with a story. If you want to make funny webcomics then this book won’t be much use to you. But if you want to publish graphic novels or manga-style stories then Framed Ink is practically a necessary resource on your journey. 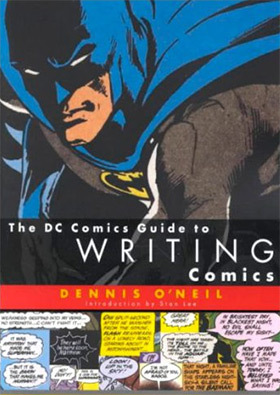 Dennis O’Neil is a well-regarded comic industry legend with decades of experience, all of which he willingly shares in The DC Comics Guide to Writing Comics. This book takes a look at writing first with a deep dive into storytelling. Dennis covers outlining topics and writing the script first vs over-planning and orchestrating plot points. He also shares tips on building subplots and putting relevant characters into those subplots. Anyone who wants to make story-driven comics should check out this title. It’s based in the DC Comics editorial style but it applies to all forms of comic writing and cartooning. You’ll learn about the industry itself along with techniques for writing stories that grab attention. 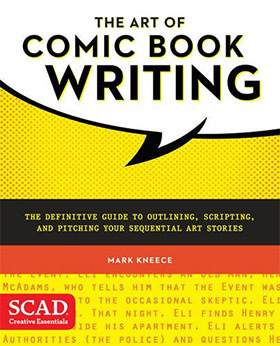 This book will prove useful to every comic writer whether you want to create a short mini-series or develop an entire library of comics. There comes a point where you might have enough artistic skill, but just don’t know how to organize your thoughts into visual form. That’s where Writing and Illustrating the Graphic Novel can be a huge help. Over 160 pages graphic artist Daniel Cooney shares advice for framing shots, organizing sequences, and planning story structure in comic panels. Designing an entire graphic novel is a big task. This can include inking, coloring, lettering, and plenty of editorial work. The advice in this book cannot be sought anywhere else. It specifically pertains to graphic novels and it’s coming from a guy who’s published a lot of work in this field. 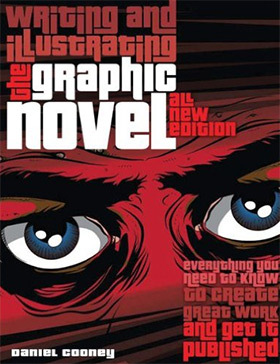 If you want to create your own graphic novel then this book will prove immeasurably helpful. But no matter what type of comic at you want to create I guarantee there’s a book in this list for you. I recommend all of Scott McCloud’s books especially Making Comics. 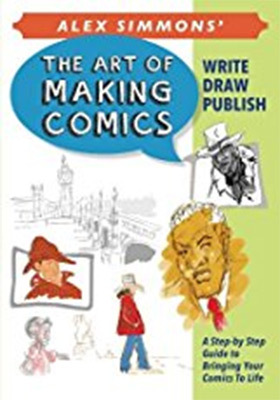 If you’re a complete beginner I’d also recommend Art of Making Comics along with the quirky yet educational Drawing Words and Writing Pictures. But if you need something a little more specific take another look over this list. You’ll find resources for every type of comic from funny cartoons to digital webcomics to action-packed comic books and graphic novels. The first step is knowing what you want to do, the second step is taking action. If you work hard then everything else will eventually fall into place.